Campers learn the proper mechanics of sprinting that will translate into increased speed and core strength. Camp will provide core exercises, running, sprint workouts, hurdle walk-overs, and more. Learn fundamental running skills that translate to a host of other sports, including Football, Basketball, Soccer, Tennis, Lacrosse, and any sport requiring speed and/or agility and overall body strength. Camp is led by a 5x Track & Field Olympian, whose accolades include being a multiple Olympic and World Championship Medalist, World Indoor Champion, Former World Number 1 Ranked 400M Female Sprinter, NCAA Champion for U.Tex, and U.Tex Women's Hall of Fame Inductee. Please enter other relevant information about camper/student (e.g., interests, food allergies, special learning abilities/disabilities, discipline issues, etc.). ​4Points Academy Camp Guides/Teachers are not equipped to serve children with serious learning disabilities or disciplinary issues. Please select the specific days you will be attending the camp. Note that the pricing per day varies per day based on the total number of days selected. As a general guide: 1 day - $40; 2 days - $70; 4 days - $120; 8 days - $230. Also, please identify if you are eligible for a specific one of the discount categories. . Registration for 4Points Academy Camps is complete only after your payment is received/processed. Payment for the selected 4Points Academy Camps can be made by Credit Card or Check. To pay by Credit Card, kindly enter all of the requested information below so we my process the card. If you prefer to pay by Check, please drop off your check at the school's address a minimum of 7 days prior to the start date of the first Camp. Kindly place your check in a sealed envelope with "4Points Academy Summer Camp Registration" written on the outside of the envelope with the full name of the registered Camper(s) (your child) identified on the check and/or the envelope. Checks must clear prior to the date of the camp to be registered. An additional $35.00 processing fee shall be charged for any returned check. If paying by Credit Card, an email confirmation will be sent. On-site registration available, beginning at 5:45PM. Registrants will be required to fill out an application and waiver form. Payment by check or cash only. An additional $5 processing fee applied to on-site registrations. No refund for cancellations occurring within 7 days of start of camp. However, up to 50% of the camp fee can be allocated for use in another camp. 4Points Academy reserves the right to cancel or postpone any camp due to: (i) the camp not attaining the minimum enrollment; or (ii) unavailability of the camp instructor; or (iii) unplanned events outside of the control of 4Points Academy/IQuest. 4Points Academy shall provide as early a notification as possible to parents should a cancellation be required. 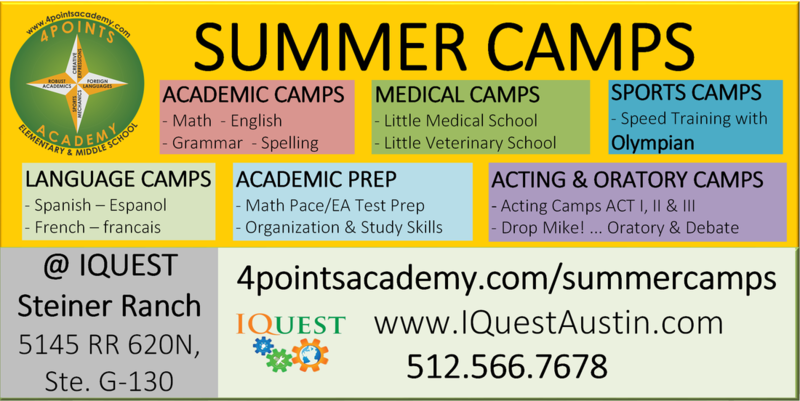 I am hereby enrolling my/our child in one or more of the above selected Summer Programs of 4Points Academy/IQuest in Steiner Ranch. I authorize 4Points Academy/IQuest to charge my credit card for the full cost of the selected programs/camps. I understand that payment for the selected program is due prior to the start of my child's participation in each camp, and agree to the stated refund policy. Each Camper is expected to comply with the Academy's conduct policy, which requires Campers be respectful of Teachers, Guides, and other Campers participating in the Summer Program, at all times, and to not engage in any activity while at the 4Points Academy Camp that is dangerous or harmful to self or others. A Camper who does not comply with this policy can be removed from the Camp Activity and/or not be permitted to continue with or participate in certain activities of the Camp. A Camper who is removed because of inappropriate conduct or bad behavior is not entitled to any reimbursement or refund of fees. By clicking on the register button below, you are verifying that you are the legal representative of the child being registered and agree to (i) register your child in the selected clinic, (ii) absolve the Academy and its representatives and agents from any and all liability that can or may arise from your child's participation in the clinic, without limitation, (iii) and permit the Academy to take pictures and videos of the events. Please direct any enrollment questions to camps@4PointsAcademy.com or call 512.991.7950.